How could someone hate their cute little dog so much that they'd subject the poor pup to the indignity of wearing such a magnificently horrible thing? Won't someone think of the (dog) children? That poor dog. It's trying so hard to look dignified. 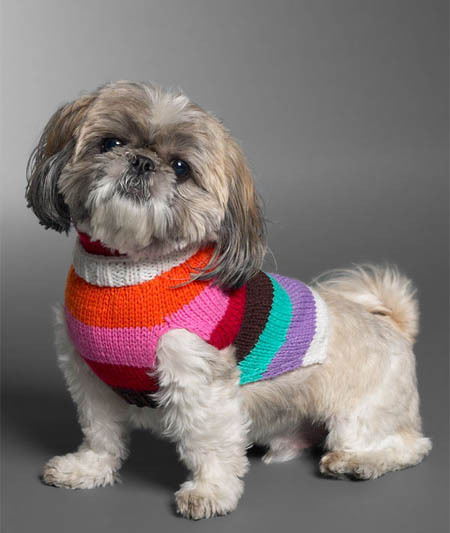 It's good to see, though, that the people at Nordstrom have a sense of humor - the product name is Fetching Multistripe Dog Sweater. Aww... that's cute! Do they have them for fish? Awww so -- what? Cute? No, no, no. And for our French viewers. Non, non, non. That sweater is homicidal. Poor dog. I can't believe you were shopping at BoyGeorge.com again. We can't keep having this talk. I'm with HWG and RandomBen. Wrong, wrong, wrong. Hideously wrong.